First line: "I smack into him as if shoved from behind." I'm not ashamed to admit that I picked up this book based on the gorgeous cover alone. Bonus: I love books that alternate between two main characters POV. 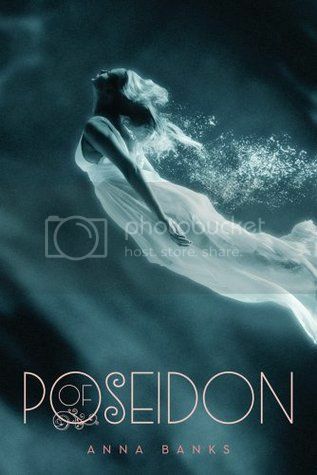 Of Poseidon was a fun read - if you enjoy the schadenfreude of yelling at characters who are Too Dumb to Live. Clumsy Emma and her best friend Chloe are enjoying a vacation on the Florida beach before they go off to the college in the fall. Things quickly take a serious turn when Chloe is eaten by sharks. Emma is very dramatically super sad that her token black friend is dead. In the meantime hunky stranger Galen is hiding a secret - he's actually a merman. He's actually a royal alpha-male merman, or Syrena as they're called, who is immediately smitten with Emma. He decides to behave like a creepy stalker and chase Emma around, moving to New Jersey so he can keep tabs on her. It's explained to the reader that this is okay, because Galen's culture is male-dominated. Galen's feisty sister Rayna is given away in marriage to Galen's friend Toraf without her consent, and everyone seems right on board for that. Galen and Emma are Meant to Be Together - Emma's unusual violet eyes give away her half Syrena heritage, and Galen hopes that she can unite the warring Poseidon and Triton tribes. Galen's main obstacle is that he feels Emma rightfully "belongs" to his older brother Grom. Emma has all the hallmarks of a Mary Sue - gorgeous, klutzy, unusual eyes, special powers, (like Aquaman, she can talk to fish) she's as dumb as a box of rocks, yet everyone is smitten with her. Later in the book, Emma and Galen hit a rough patch and break up. Emma is on a date with nice guy Mark, and Galen shows up and angrily demands that she get out of Mark's car and come with him instead. I was shouting out loud, "No, Emma, no! Don't go with him! So what if he's got great pecs? He's a total weirdo, and threatening other guys you spend time with is such a red flag! Don't do it!" On more than one occasion she even describes Galen as having such an intense stare that he has "serial killer eyes." Of course, Emma decides that she must go with him, in order to protect Mark from getting beat up, since a mere human would not be able to stand up to Galen's superhuman super-strength. Then Galen refuses to drive her home, instead, pulling over on an abandoned stretch of road and guilting her into taking him back. Gross!